Recap: The Girl Who Kicked the Hornet’s Nest is the third and “final” novel in the Millenium series. It picks up with the protagonist, Lisbeth Salander, being transferred to the hospital after she narrowly escapes death in the second novel. Salander spends the majority of the book in the hospital, healing and waiting to stand trial for the attempted murder of her father, Alexander Zalachenko. Nest centers on the way in which Mikael Blomkvist (a reporter, who is also a good friend and former lover of Salander’s) furthers his investigation. With his investigation also comes revelations about The Section, the group within Sweden’s Security Police, or Sapo, that has been covering up illegal activity for some 30+ years. 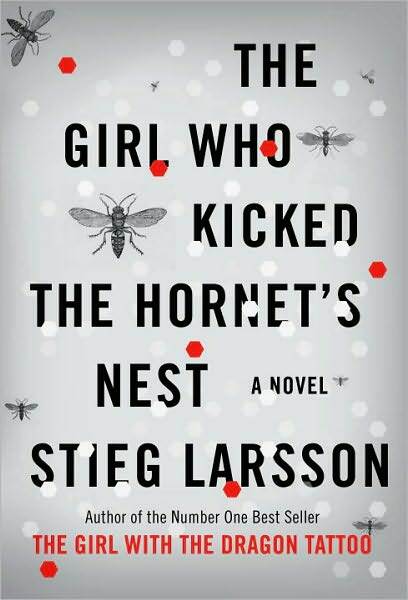 The Girl Who Kicked the Hornet’s Nest is a direct sequel to The Girl Who Played With Fire. Whereas Fire explains Salander’s background and history to the reader, Nest reveals this information to the other characters. Salander is an undeniably jaded woman, but Nest confirms that she isn’t crazy. Her innocence is proven as the complicated web of lies, cover-ups, and murders unravels. The best part of the book is learning about the Section – its function, power, and disregard for those hurt in the crimes they work to cover up. In Fire, we learn there are a bunch of rats, but we don’t care. In Nest, however, we learn how integral the Section is to the story. And let’s be honest. Audiences love a good story about a rat getting crushed. As a reader, one becomes more caught up in this plot than the fallout of the murders that happened in the second book. The one downfall of the novel is the access Blomkvist gains regarding the police’s murder investigation. Yes, he’s a journalist and has the ability to investigate. But as a journalist myself, I know the police would never give media the access Blomkvist receives. Though one might say it makes sense because he is a part of the story being investigated, I don’t believe he’s so involved to be allowed to sit in on private meetings among the police and the Prime Minister. **Stieg Larsson died of a heart attack in 2004. By then, he had written 3 novels and half of a fourth. His longtime girlfriend, Eva Gabrielsson, who has published her own memoir, could potentially publish the fourth. But right now, she has her own legal matters to contend with. Nice review of the book! First of all, I think it should be said that the whole trilogy was truly incredible! Lisbeth Salandar was created by Larsson in such an intricate way that you really fall in love with her, despite that she pisses you off every other chapter. I didn’t like this book as much as I liked the second book. I thought the murder mystery was fast-pace and exciting, while this story bogged me down with all the complexity of the Section. I would have liked to see a more exciting trial too…I feel like they sped through it, quickly acquitted her, and then the whole thing was over like that! I will agree with you about Blomkvist working with the government, but I bought it. I also liked your commentary on Figuerela. One thing I would have liked to see more of was some questioning of Salandar on how she got her money and her knowledge by the police. In both the second and third book, I kept thinking that Salander HAS committed some crimes. I was waiting for that to come into play and see how she dogded those bullets. Lastly, being a journalism major like you, I would have liked to see the police question some of the sources of Millenium/Bloomkvist a little more. But then again, that could be a whole other series. While I just offered all criticism, it still was a great book! And great start to your blog!